Throughout northern India and Nepal you'll see variations on the idea of Jali carving. The term "Jali" comes from the Urdu word for "net" and the characteristic of Jali is that a solid surface has been carved to create empty spaces in the surface. Whether made from stone or wood this technique has been used on balconies and exterior walls to cut down the glare and heat of the sun and to allow air to ventilate the rooms and interior spaces. Air flowing through many small spaces cools more effectively than an open window. The shadows created by the Jali creates interesting patterns on the floor and Jali is also used as a decorative feature in it's own right, the designs can be geometric or floral. Jali screens are also used so that the viewer on the balcony can look unseen down onto the courtyard below. Often the women's quarters of palaces would have balconies decorated with Jali to allow the women to remain hidden while they were able to watch the activities below. Artisans have developed the carving techniques to produce Jali craft items and wooden screens in marble and wood with the same characteristics of semi transparency. 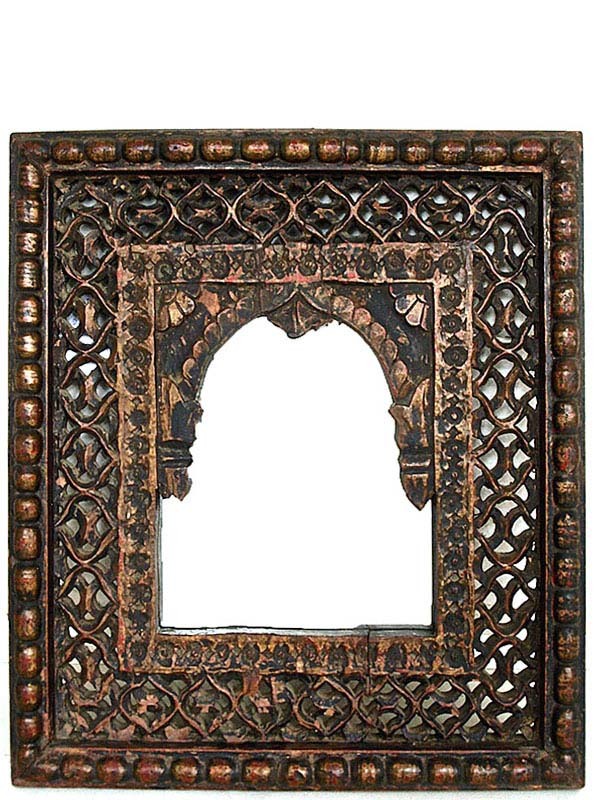 The image below is of an old wooden Jali mirror.